We are a leading Manufacturer of tea bag in outer envelope packing machine and automatic filter tea bag machine from New Delhi, India. Capacity 30-50 tea bag per minutes. 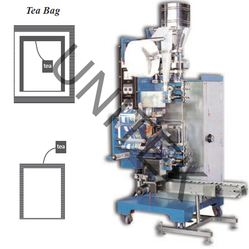 PLC operated with Touch Screen panel tea bag machine comprises of Tea Bag in Outer Envelope Packing Machine. The tea bag is formed in the first station and the outer envelope is simultaneously formed in the second station. The formed tea bag is then automatically inserted into the outer envelope and the outer envelope is sealed. This machine is suitable to pack Tea, Herbal products, Coffee. All components in direct contact with the product are made of stainless standards or food sanitary parts. Motorized adjustment of measuring cups. Packaging Details: Sea worthy wooden crate packing as per customers requirement. Capacity 32 - 50 bags per minutes. UNITEK offers tea bag machine with string & tag. The String and Tag Tea Bag Machine formation from nonwoven heat sealable filter paper the thread insertion and tagging are fully automatic and give an output of 1800/tea bags per hour. The machine is designed with technical perfection and construction to meet your production requirements exactly both now and in years to come.